I ate homemade ravioli today…. Beat the eggs and add them and the salt to a mixing bowl already filled with flour. Use your hands and mix to form a dough. If you can’t get all the flour hydrated into a dough, add more water until you can form a nice firm but sticky dough. Knead the dough for about 10 minutes, or until it is smooth and stretchy. Although you can roll out the ravioli sheets immediately, letting the dough rest for 20 minutes or more allows the proteins in the dough to relax and makes rolling much easier. Rest the dough covered under the mixing bowl so it won’t dry out too much. Split your dough into three parts. Take one of your dough balls and place it on a floured surface and begin the rolling-use enough flour so that your rolling pin (or in my case bottle) doesn’t stick to the dough. Keep rolling until your dough is pretty thin. So that you can see your hand through it-I made mine way to thick, don’t do this…just keep rolling. I used a basic kitchen cup and made little circle with the rim of the glass. I put these on a floured surface and combined all the scraps at the end. 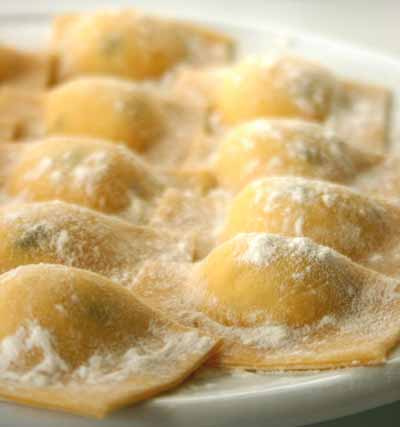 I also read about another way to make raviolis you make your dough into a large thin sheet. Then you spoon your filling on to your dough-painting egg around your filling. Drape another piece of dough over top and then press together. Using a knife cut the ravioli into squares, circles or heart pieces. So I learned that there are a lot of different ways that you can do the filling. It was a bit of trial and error but in the end I think I figured it out. You can take your individual circles and put a teaspoon of filling in the center then fold the circle into a half moon, pinching the sides together as you go. You can use an egg (I used my left over egg whites) as a sealant or a little bit of flour works too. I ran into some problems doing it this way-mainly my filling spilling everywhere. But I think this is a great way to do it, if you keep a couple of things in mind-the thinness of your dough and the thickness of your filling. For me-my dough was a little thick and my filling (more on that later) a little thinner. So I found another way to make these little ravioli’s. I put a spoonful of filling in the center of a circle of dough that I had made then I took another dough circle and placed a little egg (with my finger) around the edges and then sealed the two together. I then took a fork and pressed the fork into the outer edges for some decorative flare. I think I was trying to impress myself. This worked great. Then you place them into a pan of salted hot water. I did them in batches of four to five. Let them cook for a few minutes. Be gentle and use a spider strainer to fish em out and place them on a plate. I didn’t cook all of them, though. I just cooked what I wanted for that day. You can place them in a freezer until you want to cook them, just place them on a cookie sheet to freeze first. So the reality is you can do just about anything in a ravioli inside as long as you can get it to a consistency so that all the goodness can be contained in one spoonful. What I did was make a spinach filling but you could do meat, cheese, mushrooms…get wild. What I did was cooked the onion and garlic together with a little bit of olive oil until translucent. 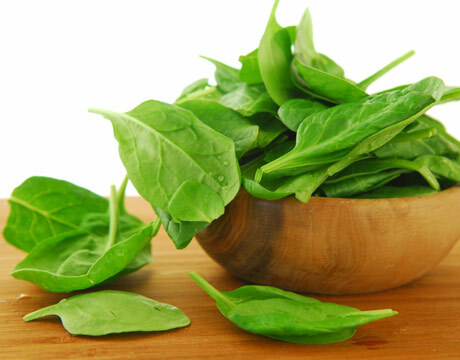 Then I added spinach and let that get nice and wilted. Then-I blended it all together in what in the states would be a food processor-just get everything small. I added lots of fresh greens and shredded cheese and viola. That is it.